Think of Borneo and you probably think of orangutans. These great apes are forever tied to the world’s third-largest island in both habitat and popular culture. 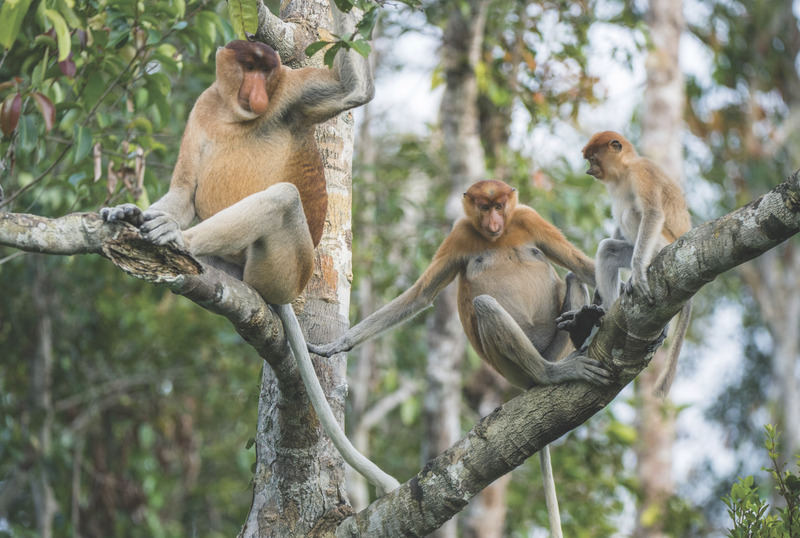 But there’s so much more to Borneo when it comes to the wildlife. 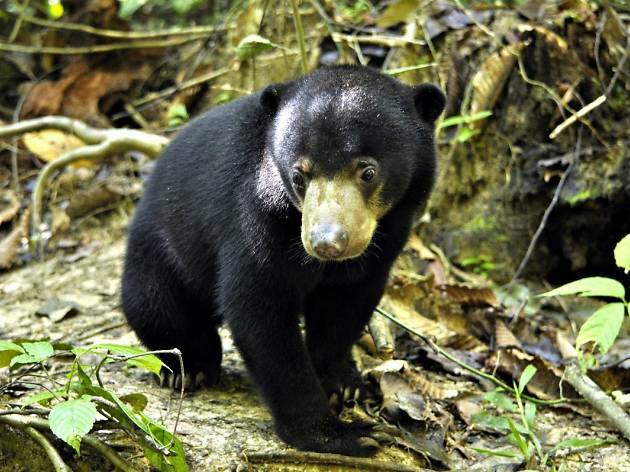 From the sun bears to the flying lizards, the 140 million-year-old rainforests are home to an array of animals. Quick geography lesson: Borneo is the biggest island in Asia and is politically divided among Malaysia, Brunei and Indonesia. Quick ecology lesson: there are about 15,000 species of flowering plants on the island, with 3,000 species of trees, 221 species of terrestrial mammals, 420 species of resident birds and 440 freshwater fish species. 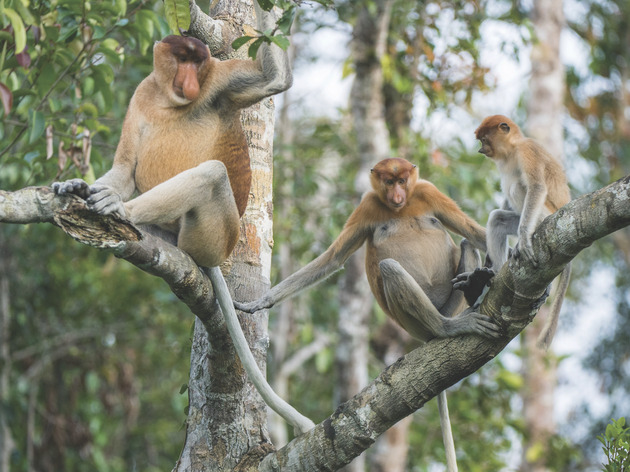 Quick tourism lesson: the rainforest may be one of the few remaining natural habitats in the world for the orangutan but there’re many other creatures besides the orange primate to meet on your travels here, just like we do on our trip. Our first impressions on our wildlife hunt are hardly great. Driving through seemingly endless palm oil plantations in Borneo’s Malaysian state of Sabah, it looks like there’s little natural habitat left. However, about 20 percent of the state is protected rainforest and, when we arrive, we find it’s teeming with wildlife. Sabah’s capital, Kota Kinabalu, is less than three hours from Hong Kong and its booming fisheries have made it one of the richest states in Malaysia, so it’s a perfect base as we trek out into the green unknown. Okay, let’s do orangutans first as you’ve still got to see these awesome primates in the flesh if you visit Borneo. A 40-minute flight from Kota Kinabalu is Sandakan. Just outside the town, at the Sepilok Orangutan Rehabilitation Centre (Sabah Wildlife Department, Sandakan), adult orangutans live semi-wild, emerging from the forest for two daily feeding sessions while the infants play in a nursery. Just $55 gets you in for the whole day, with a $20 fee for taking a camera in. The 9am feeding session is extremely popular. You’re likely to see the beasts out in the open but they’re vastly outnumbered by the human visitors. We recommend staying for the centre’s 2pm feeding session instead, where we’re treated to a beautifully intimate up-close-and-personal encounter with these fantastic animals. 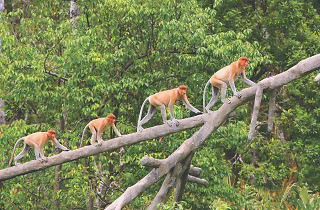 There’s a lot more to see around Sepilok, though, than just the orangutans. Opposite the rehab centre is the Bornean Sun Bear Conservation Centre (PPM 219, Elopura, Sandakan; bsbcc.org.my). 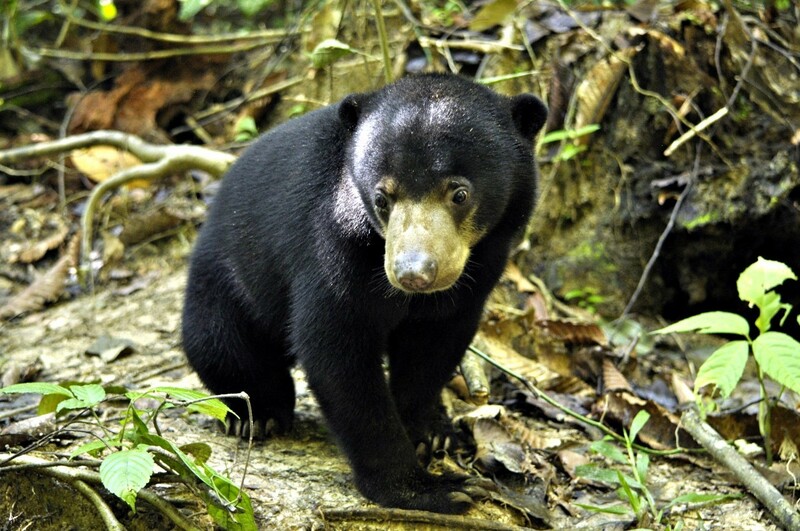 Sun bears, the smallest species of bear in the world, are threatened by deforestation and the demand for their bile, which is used in traditional Chinese medicine. While the orangutan rehab centre closes between 11am and 2pm each day, the sun bears can be seen at that time gamboling and eating lunch. Entry is just $30. A bargain for this captivating bear necessity. Nearby is the Rainforest Discovery Centre (90715 Sandakan; forest.sabah.gov.my), a much quieter attraction which offers opportunities to walk well-marked forest trails and climb a spectacular forest canopy walkway. It’s also just $30 admission and, for this, we see flying lizards, both graceful and dramatic in flight, plus Borneo’s giant squirrel. The day is spent exploring and meeting countless critters. Tip: come back here on different days to see as many weird and wonderful creatures as you can handle. Rehab and wildlife centres in the rainforest are all well and good but we find trekking out to Borneo’s caves is a hugely worthwhile experience. From our base near Sepilok, we join a tour to the Gomantong Caves (Gua Gomantong, Sandakan; sabahtourism.com), which are famous for housing edible swiftlet nests that are used in bird’s nest soup. Only the easily accessible Black Cave is open to the public but it provides an unforgettable multi-sensory experience. The vast cave’s interior is a hellish scene. British TV wildlife legend David Attenborough allegedly called it the worst place he’d ever filmed. Even our guide seems scared to enter this landscape that’s formed from mountains of guano excrement littered with the carcasses of unfortunate baby birds and dead bats, crawling with countless millions of cockroaches and venomous centipedes. Yup, venomous centipedes. We see a few of these beautiful-yet-deadly crawlers. A constant light rain of bird droppings falls on us from high above and an acrid ammonia smell fills the air. Yet people actually live in here, precariously scaling the cave roof to collect the precious bird nests. Insane. But an incredible experience. After a good wash, our tour continues to the Kinabatangan River, with the Borneo Dream team (one-day tour is $985 inc lunch; borneodream.com). We climb into a small boat but, unfortunately, there’s no guarantee the animals you’ve travelled all this way to see will appear. But, after our overwhelming experience in the cave, it’s a relief not to be confronted by the river’s man-eating crocodiles. We don’t see the pygmy elephants that dwell in the area but we do spot a magnificent water monitor, a huge lizard which we initially mistake for a small crocodile. We also meet wild orangutans, silver leaf monkeys and proboscis monkeys. Found only on Borneo, the proboscis monkey’s incredible nose lends it the appearance of a Jim Henson puppet. But they’re not shy about it, mooching around the riverbank like cantankerous old barflies. 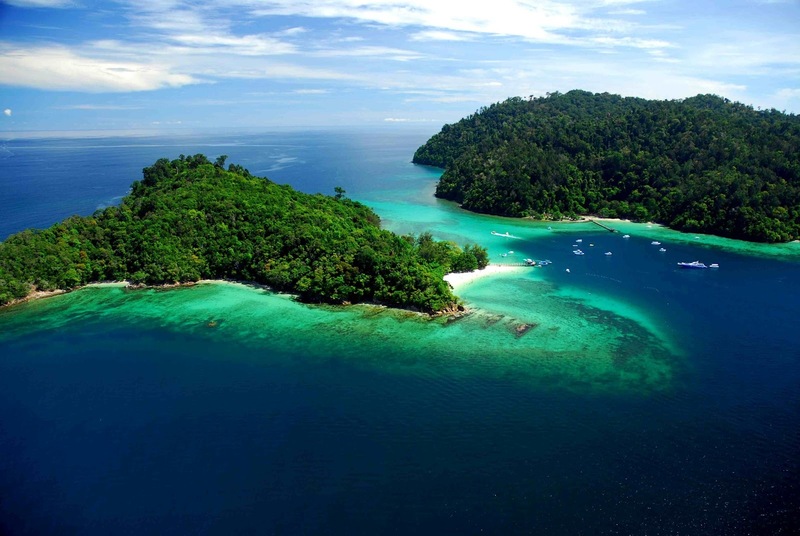 After returning to Kota Kinabalu, we head to the island of Pulau Dinawan, just off the coast. It’s occupied by a small resort and split in two by a lagoon. As we arrive, our hosts show us a pair of huge alien-like horseshoe crabs that have been found in the lagoon and introduce us to the island’s flock of gregarious hornbills, a bird which looks like it’s been flown in from Jurassic Park. The island is surrounded by coral reefs. They’re a short way from the beach and teeming with tropical fish. Later on, we take a nighttime wade in the lagoon, where our guide points out bioluminescent jellyfish larvae and hundreds of starfish and sea cucumbers. 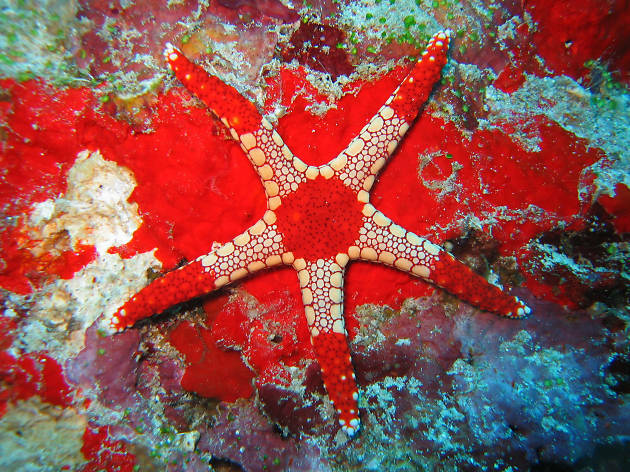 The starfish come in an array of sizes and the cucumbers, with their leathery skins, are fascinating to watch as they move at a sloth’s pace in the waters. 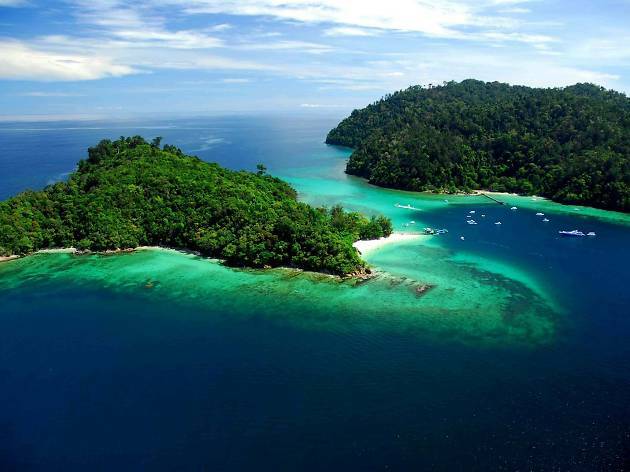 While it’s billed as a beach retreat, Pulau Dinawan surprises us with its wealth of wildlife. 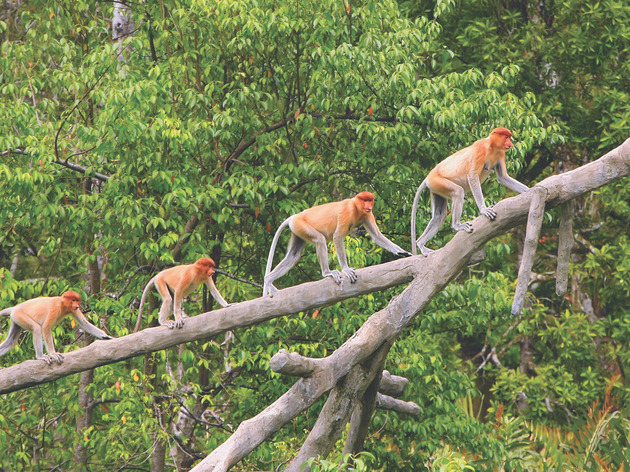 In fact, when you get past the orangutans, Borneo may surprise you with its collections of creatures at every turn. If you fancy playing Indiana Jones in the Gomantong Caves or Robinson Crusoe on your own private island after you’ve visited the rehab centres and trekked in the rainforest, then you must go. An animal extravaganza awaits just three hours from Hong Kong. Air Asia flies twice a day between Hong Kong and Kota Kinabalu. Return fares are from around $1,220. There are several flights every day between Kota Kinabalu and Sandakan, which is a quick 30 to 45-minute hop. A return with Malaysia Airlines costs around $440. There are several hotels close to Sepilok. 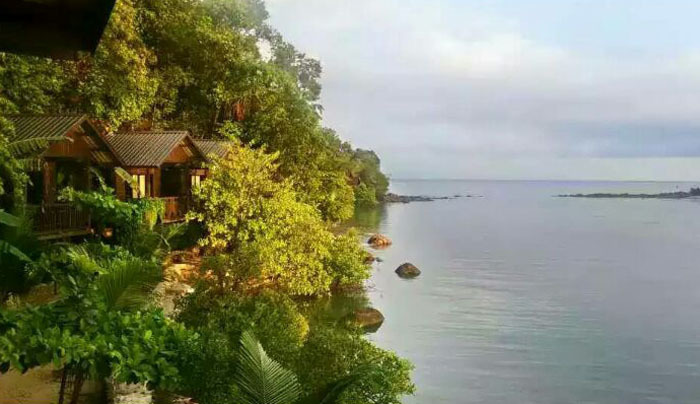 The Sepilok Nature Resort is the most convenient and luxurious, with double rooms from $512. Its lakeside restaurant serves a fab lunch. We stay at the nearby Paganakan Dii Retreat, a family-run place with helpful staff who help organise our transport and transfers. A private cabin sleeping two costs $300 and dorm rooms are available for much less. 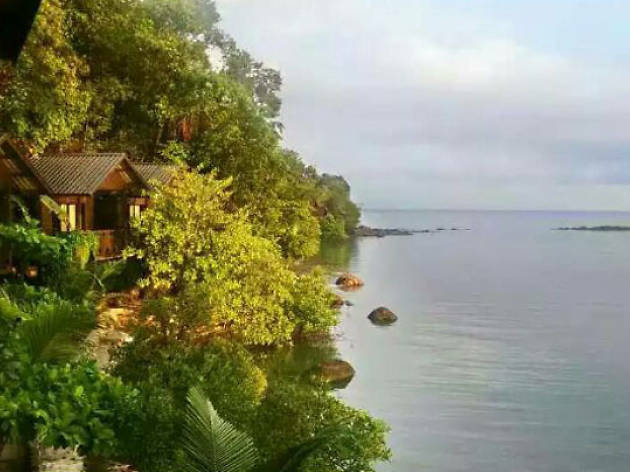 Sunborneo Resort (pictured) on Pulau Dinawan has a range of private cabins from $1,060 a night, which includes unlimited use of sea canoes and snorkelling equipment, plus three grilled seafood meals a day.